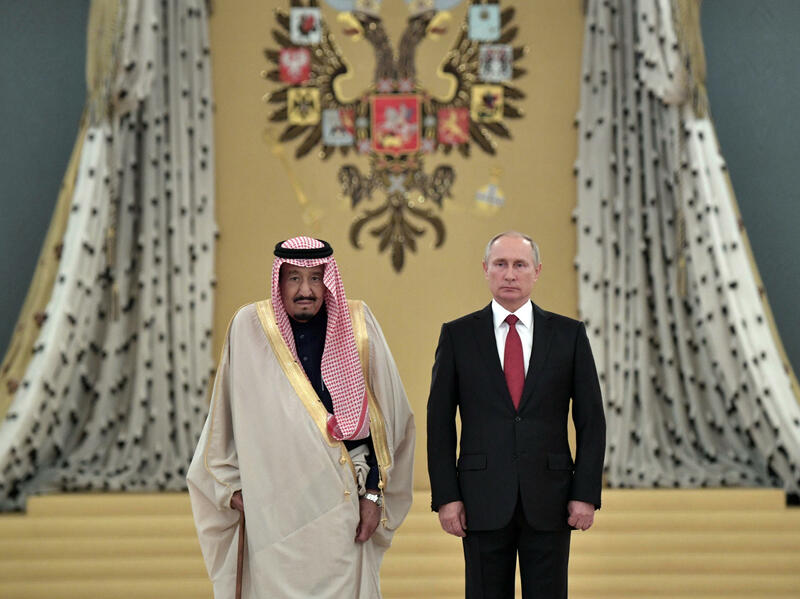 Saudi Arabia's King Salman and Russian President Vladimir Putin pose for a photo during a welcoming ceremony at the Kremlin in October 2017. Last year, Saudi Arabia and Russia were the world's second- and third-largest oil producers, respectively. "The market perceives that Saudi Arabia and Russia are having a strong and fruitful collaboration to keep the price of oil high and rising," said Amy Myers Jaffe, a senior fellow at the Council on Foreign Relations. The success of that collaboration is remarkable on several levels. Jaffe notes that the bad blood between the two countries dates to the former Soviet Union's invasion of Afghanistan in 1979. More recently, Russia and Saudi Arabia have staked out opposing positions over the war in Syria and over Iran's growing influence in the Middle East. "What is surprising is they've managed to put aside a history of political distance or even political animosity to find common cause around economics," said Meghan O'Sullivan, a professor of international affairs at Harvard's Kennedy School. "It's one of the most interesting geopolitical developments to happen in the last few years." Saudi Arabia and Russia putting political differences aside for the goal of financial gain is one thing. Making it work in the global oil market is another. Joint efforts to control oil prices have floundered in recent decades. Analysts say that OPEC's ability to coordinate and manipulate prices has been overwhelmed by cheating among members and by the bounty of shale oil produced in the United States. Russia is not an OPEC member. But in December 2016, it made a deal with other producers, notably OPEC members led by Saudi Arabia, to attack the global oil glut by cutting production about 1.8 million barrels per day. The price of oil dipped to $27 per barrel in February 2016. It has bounced back to more than $68 a barrel. "Typically in OPEC agreements first month is good, first couple of months are good with some cheating, and then the thing dissipates over time," Jaffe said. The goal for the entire group is to reduce excess inventory and force prices to climb. But that takes time. Some countries may not want to wait. They'll violate the deal and keep production high, selling into the global market, profiting in the short term. They bet that their actions alone won't make much of a difference to the price. But if enough countries do the same thing, or if the largest producers cheat, the deal collapses. The oil glut remains and prices stay low. Saudi Arabia and Russia were the world's second- and third-largest oil producers respectively last year. (The U.S. was first.) And by all accounts, neither of the oil giants has reneged on pledges to cut production. The near collapse of Venezuela's output has also tightened the supply of oil. The surprising success of the deal could potentially reshape energy markets for years, O'Sullivan said. "We had the crown prince of Saudi Arabia — Mohammed bin Salman — visiting the United States a couple of weeks ago. And he made a comment that Moscow and Riyadh were talking about a long-term relationship revolving around oil that would be 10 to 20 years," she said. The Russia-Saudi Arabia alliance isn't the only factor driving up the price of oil. It coincides with rising demand and the return of solid global economic growth. Factories are operating at higher capacity; more people are working, commuting and traveling for vacations. China's thirst for oil soared in 2017. And Americans, accustomed to years of cheap gasoline, have been opting for trucks and SUVs instead of economy cars. All this begins to shrink the excess supply of oil. It's a fairly dramatic turnaround from 2016, when the world was swimming in crude and the average price of gasoline dipped for a while below $2 a gallon. Rising energy prices haven't escaped the notice of the White House. Earlier this month, President Trump tweeted his displeasure. It's unclear what leverage, if any, the White House has to undo the Saudi-Russia agreement. Gasoline prices are rising, never a happy fact for a president, though at an average of $2.81 a gallon they're still moderate by historical standards. But if gas blows past $3 and heads toward $4 a gallon, it could become a hot issue in the midterm elections.